Arhaan Associates are Real Estate Advisors and Builders. This company deals in sale, purchase and renting of residential and commercial property in Lahore. Arhaan Associates is located in Commercial Area, DHA Phase 3, Lahore. They are Real Estate Advisors and Builders. This company is also known as A A Group. 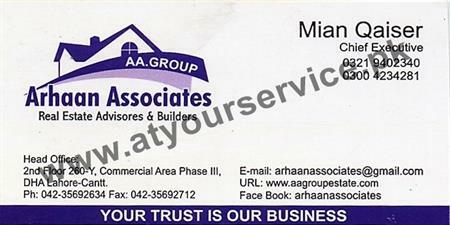 Arhaan Associates deal in sale, purchase and renting of residential and commercial property in Lahore.